Humphrey, the world’s cutest hamster, is also the kindest and wisest. He’s always ready to lend a helping paw. As the pet hamster for the whole of Room 26, Humphrey’s used to observing the human species, working out what makes people tick. But has he got what it takes to help Pay-Attention-Art with his schoolwork, make friends with his new rival, Og the frog… and dodge scary teacher Mrs Brisbane, the only person who refuses to be Humphrey’s friend to the end? Three super-duper books starring Humphrey, the smartest school hamster in town! I’ve read all of the Humphrey books and I think they are GREAT-GREAT-GREAT!!!!!!!! A really good book but the book is described by a hamster I never thought id read a book described by a hamaster , this book is about the class hamaster in this one his best friend gets taken by aliens . 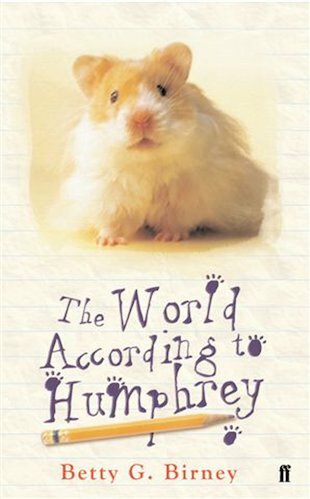 the world according to humpthry is a great book about a fablous hamster but he has to go to school how boring is that but he also loses his best friend read more to see!